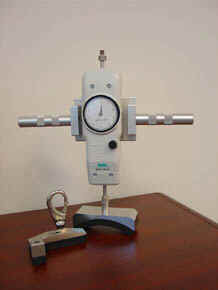 The Chatillon® MSE-100-M Dynamometer is a simple-to-use, ergonomically designed mechanical instrument ideal for clinical or field muscle strength evaluations. The MSE-100-M features a large, easy-to-read 2-1/4” analog dial (100 x 0.50 lbf) with tare ring. The gauge is uni-directional and displays force with an accuracy of better than 0.5% of full scale. The MSE-100-M comes standard with a handle assembly and a protective carrying case. Use with optional Functional Capacity Kit (FCEK) or Muscle Strength Comparator Kit (MSCK). The handle assembly is easily removed for storage. A convenient peak hold switch, located on the front of the instrument, can be set to automatically freeze the dial measurement at the peak force applied by the patient. All MSE-100-M gauges come standard with a Certificate of Calibration with data verification to NIST.